Wilbert Trudell was born in Simonton, Texas, on January 4, 1926 to Wilbert Joseph Trudell and Ollie Ida Trudell. Impacted by the Dust Bowl of the 1930’s, he only completed one year of high school. It is likely that his family needed to him to contribute to the household income. At some point he moved to California where he enlisted into the U.S. Army. Before becoming a soldier he worked as a semi-skilled automotive repairman. Trudell enlisted in the U.S. Army on February 19, 1943. At the time he was 5’10" and 190 pounds. It is possible that he lied about his age because his birth certificate indicates that he was born in 1926, making him only 17 when he joined. Because of his young age he had no wife or children at the time of enlistment. Wilbert Trudell was born in Texas which experienced the effects of the Dust Bowl. This is likely why he moved to Los Angeles. Los Angeles, like most of the state of California, was busy with the war effort after 1941. After the attack on Pearl Harbor many factories for cosmetics and other materials were turned into factories that focused on munition production. There were factories that focused on making bullets, others focused on tank, ship, or plane construction. California also played a major role in agriculture. California had acres of land dedicated to food production before the war broke out, and when war was declared, food production increased considerably. After the war began, millions of young men left their jobs at factories or farms to go fight in the war, leaving businesses short handed. Since factories and farms were understaffed, employers reached to new sources of labor. Executive Order 8802, issued by President Franklin D. Roosevelt, prohibited racial discrimination in the national defense industry. Economic opportunities sparked the second Great Migration of African Americans to northern and western cities. Millions of women also went to work in the factories and farms to help the war effort. With low unemployment, the U.S. government created the Bracero Program. This program gave temporary work visas to Mexican laborers who came to work in U.S. factories. Wilbert Trudell became a member of the 29th Infantry Division, 116th Infantry Regiment on February 19, 1943. The 29th Infantry Division was created in 1941 and trained at Fort Meade, Maryland. After training, the unit shipped to Scotland. They later traveled by train to Tidworth Barracks in Devon before partaking in the Normandy Invasion. Trudell served in the 1st Battalion, Company A. Trudell landed on the Dog Green Sector of Omaha Beach and survived to capture Vierville Draw and spearhead the assault on the Normandy coast. The company faced high casualty rates. Wilbert Trudell was a promoted to sergeant during the campaign. His job was to maintain the squad's discipline, appearance, and organization. In combat, sergeants lead rifle groups or platoons. After D-Day, the 116th Infantry Regiment pushed inland, and captured the city of Isigny pushed across the Aure River valley. They fought through the hedgerows of Normandy. In July, the 116th Infantry Regiment, 1st Battalion, Company A, found itself engaged in fierce fighting along the road leading to Saint-Lô. On July 16, American forces faced two major counterattacks from the Germans a few miles from the city. It is likely that Trudell was killed in this attack. He received the Purple Heart. He was 18 years old. Wilbert Trudell is someone that history has long forgotten but his life’s contribution to the war effort made a significant difference in the outcome of the war. He was an American hero of World War II who never got to return to the home that he defended against the Axis powers. Trudell came from a Texan family. His mother, Ollie Trudell, who was still living in Texas at the time of his death, was his next of kin. She likely felt pride in her son’s bravery and commitment to the war, while at the same instance fearful that he might not come home. After only a year, he dropped out of high school in order to start working. He was a repairman before going into the U.S. Army. He had no prior military training before he reported for duty on February 19, 1943. Trudell’s young age meant that he left behind no wife or children. Trudell stormed the Dog Green sector of Omaha Beach on D-Day. He survived against all odds. His unit was the the first to storm the beach. Wilbert Trudell was a brave man who deserves to be remembered as the hero that he was. I found the Silent Heroes Project very interesting and I like that the project has students researching soldiers that are not well known to history. This helps America’s youth to build a connection to the nation’s past. As time progresses, these soldiers may not have family to remember them and the brave actions they did. The project can change the students perspective on the war especially if the soldier is the only servicemen they know and can now celebrate on Memorial Day. It is important that the world does not forget those who died during World War II, and the wars that came before, and those who followed because every life has meaning. No one should be forgotten, especially if they fought for the freedom of others and died in defense of that freedom. If it were not for the brave servicemen who fought and died fighting against the Axis Powers, society might be very different today. Students are taught about the major generals and those that were given special recognition for showing extreme bravery or skill while in combat. Although these people are important, so are the unknown soldiers. Students are never told of the soldiers that fought and died while under the command of the generals but are told if important commanders came back after the war or not. The fact that history often loses these individual stories makes it important to rectify, which is what this Silent Heroes project does. The project has helped me form more of an understanding of the hardships that soldiers like my great grandfather faced while fighting in the war and the project gave me the opportunity to honor one more hero who fought for the United States of America and its allies. 29th Infantry Division Patch. Wikimedia Commons. 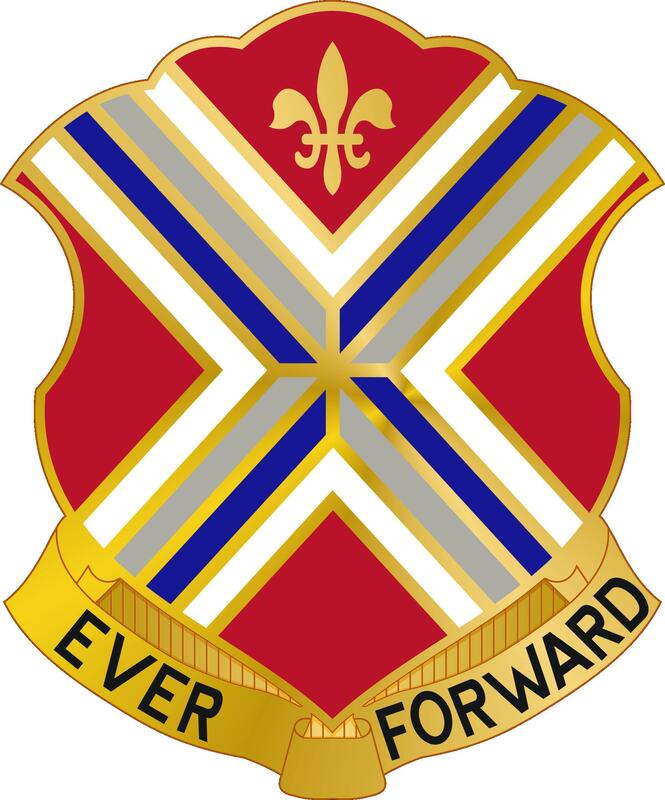 Accessed October 18, 2017. https://commons.wikimedia.org/wiki/File:29th_Infantry_Division_SSI.svg. 116th Infantry Regiment Insignia. Wikimedia Commons. Accessed October 18, 2017. https://commons.wikimedia.org/wiki/File:116_Inf_Rgt_DUI.jpg. Records for Wilbert Trudell; World War II Army Enlistment Records, 1938-1946 [Electronic File], Record Group 64; National Archives at College Park, College Park, MD [retrieved from the Access to Archival 2017 at http://aad.archives.gov/aad/series-description.jsp?s=3360&cat=WR26&bc=,sl, April 1, 2014]. Wilbert Trudell. 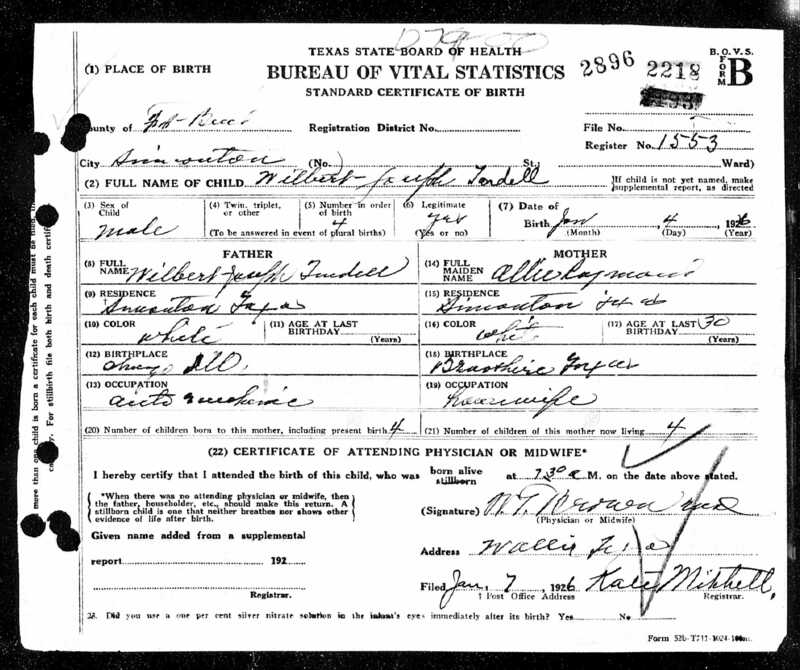 Birth Certificate, January 4, 1926. Texas State Board of Health. Digital images. http://ancestry.com. 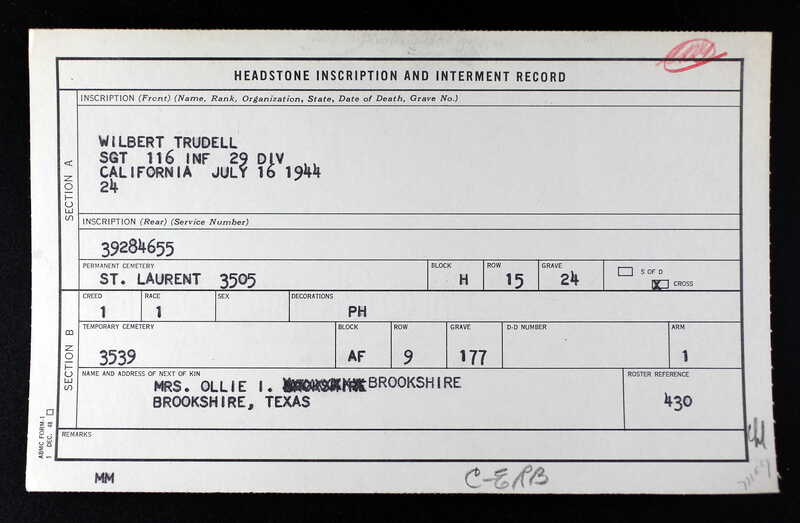 Wilbur Trudell, Headstone and Interment Records for U.S. Military Cemeteries on Foreign Soil, 1942-1949. Digital images. http://ancestry.com. Lefebure, Laurent. "29th Infantry Division Historical Society." 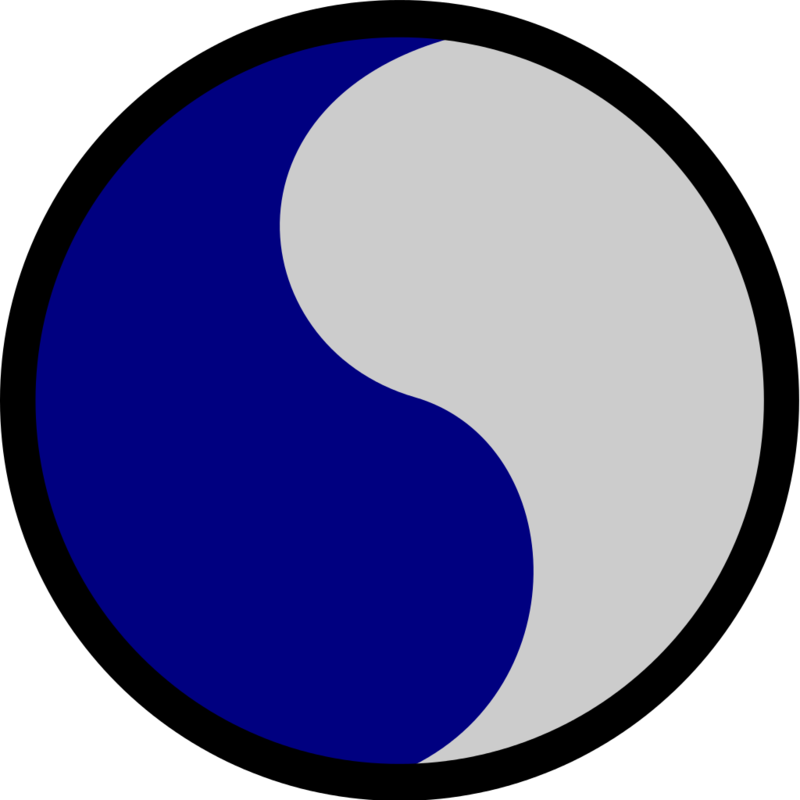 29th Infantry Division. Updated 2002. Accessed October 17, 2017. http://www.29infantrydivision.org/. “Normandy.” U.S. Center for Military History. Accessed October 18, 2017. https://history.army.mil/brochures/normandy/nor-pam.htm. "Sergeant Wilbert Trudell." Fallen Heroes of Normandy. Accessed March 6, 2017. http://www.fallenheroesofnormandy.org/Servicemen/Detail/36659. "Sgt Wilbert Trudell." Find A Grave. Accessed May 26, 2017. https://www.findagrave.com/cgi-bin/fg.cgi?page=pv&GRid=55906306. "Wilbert Trudell." American Battle Monuments Commission. Accessed October 17, 2017. https://abmc.gov/node/414256#.WeY5XFtSzIU.